Chitwan National park, the first national park in Nepal, is the perfect place to experience Nepal’s native fauna, mammals and birds. The Park was established in 1973 and was listed as a world heritage site in UNESCO in 1984. The Chitwan National park is home to at least 43 species of mammals including the Bengal Tiger, one horned rhinoceros, leopard, sloth bears, wild boar, elephant, striped hyena, genetic dolphin and many more. The park is also home to more than 126 species of fish, 590 species of butterflies and 47 species of reptiles.Chitwan is also the administrative headquarters of the region of western Nepal and the Tharu community resides within the National Park. Wilderness Excursion offers some of best 2 Nights 3 Days Jungle Safari and Wildlife Safari tour Package in Sauraha and activities amazing activities within Chitwan National Park in most competitive cost. Complete tour package in most competitive price. Day 01 :Kathmandu / Pokhara - Chitwan On Your arrival at Sauraha Bus park, Tadi or Bharatpur Airport our staff will receive you. You will then be transferred to our Resort where you will be offered refreshment & be given a briefing & its facilities. After being given your program for the day, your room will then be allocated to you. 19:00 - Tharu cultural dance presentation (which you will also participate in) by the local villagers. Day 02 :Jungle Activities in Chitwan National Park 06:00 - Wake up call. 07:00 - Canoe ride along the Rapti River. An excellent opportunity for Bird Watching and for seeing the 2 rare species of crocodiles; the Marsh Mugger and the fish eating Gharial. + Jungle Walk + on the way back one can enjoy the elephant bathing. 15:00 - Elephant Safari. 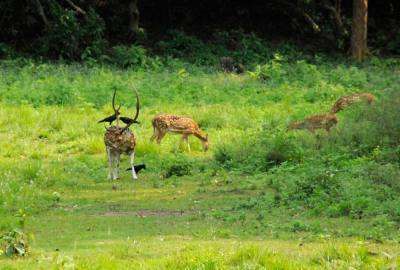 An excellent opportunity to see four different kinds of deer, rhinoceros, wild boar, monkey, leopard, sloth bear and the Royal Bengal Tiger (If you are lucky).You will also encounter many other smaller mammals that have made Chitwan their home. 19:00 - Tharu cultural dance presentation or Slides show presentation. Day 03 :To Kathmandu / Pokhara or onward journey 06:00 - Wake up call. 08:00 - Departure for onward journey. Accommodation in twin /double sharing basis in Safari Lodge. All meals: 2 Breakfasts, 2 Lunches and 2 Dinners. Chitwan National Park entrance fees. Tharu Culture show entrance ticket. Wages, accommodation and meals of your guide. All government tax and insurance of your guide. Alcoholic drinks, beverages such as coke, fanta, sprite. Personal Travel insurance and gears. Extra expenses if the trip and activities and expended. Tips and gratitude for your guide and waiters.